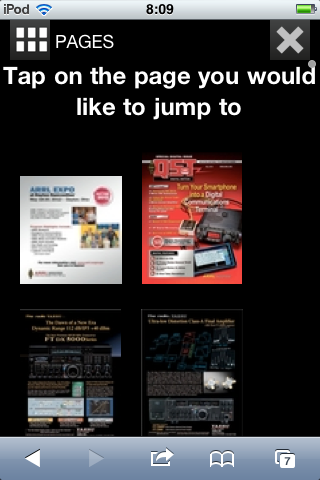 The other day I received, like some unknown number of others, an invitation to try the QST Digital Edition beta for the May 2012 issue. I am not a hard-core mobile/digital media user. But, Sarah is a librarian who has specialized in management and procurement of electronic journals and books. So, she gave me the low-down on what to look for. And, over the years, I’ve given her what-for about eBooks because, as I like to say, “I am willing to risk a single print copy of something by taking it places I wouldn’t risk taking an electronic reader.” That sums up the perspective I took when reviewing e-QST. 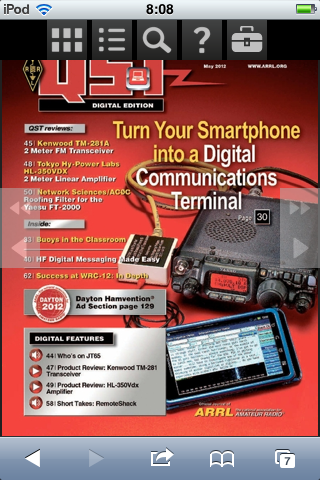 You can read about the Digital Edition on ARRL’s FAQ here. The desktop version requires Flash to use in-browser or Adobe Air and an enormous download to go stand-alone, neither of which really warmed my heart. But, it does work in the web browser of a mobile device. I have a 2nd generation iPod Touch running iOS 4 and it worked great in Safari. I now have a bit of insight as to why people might love their iPads (which I have always viewed as a more-expensive, less-convenient version of the iPod Touch or iPhone). There appear to be only two levels of zoom: fit page width and zoomed-in. No matter how good your eyesight, you need to be zoomed in to read because the characters don’t render legibly otherwise. 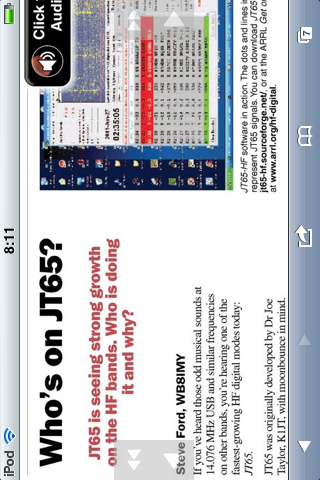 I think iPad’s larger screen might make reading it easier. Browsing page thumbnails was OK, but it’s difficult to actually know what you’re looking at before you select the page. It also would be nice if the pages were numbered in thumbnail view. 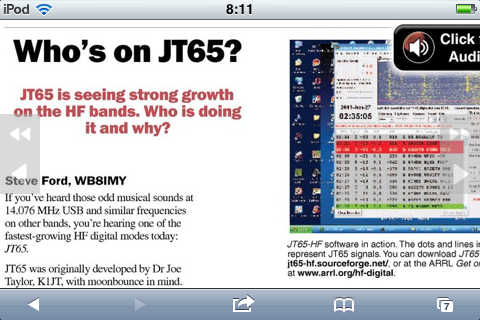 One of the big advantages of the Digital Edition is that you can do things you can’t do with the print version, like including audio of JT65. Granted, I think almost anyone who’s active on HF CW or digital knows what JT65 sounds like, but it’s a basic demonstration of the kinds of things that will be possible in the new format. Given that I’m usually done with one month’s issue by the time the next one comes out, the Digital Edition is alright for basic browsing and reading. It’s much faster to skim the print issue, at least with my barebones 768 kbps DSL connection and the higher visual bandwidth of print (read Tufte’s essay The Cognitive Style of PowerPoint for more on this and other interesting reasons to hate slide decks). The mobile version also requires you to be connected to the Internet to browse. It turns out that an entire issue is on the order of 350 MB to download stand-alone on a computer. This makes it difficult to take places where I often want to read QST (on airplanes, for instance)… It is possible to print from the desktop version (I tried it using 32-bit Windows XP and Firefox), although it seems to be slower than the mobile version (not entirely unexpected). Another thing that’s a bit different is that if you download the offline content to your desktop, you still need to authenticate to open it. It’s not clear whether this continues if you drop your ARRL membership. It is a bit different than owning boxes of back issues…even if you drop your membership, you still have the magazines. I don’t think this is a huge concern for most hams, who probably wouldn’t be interested in old QSTs if they dropped the membership. In summary, I like the concept of the Digital Edition, but I wish I could carry off-line issues around on my mobile device. ARRL hints at this in the FAQ, so I am hopeful. Saw this in my Google Reader at work and had to post. Apply to work, ham radio, …? It’s clearly an artist’s take and not an engineer’s. While browsing my local public library a few weeks ago, I stumbled across the book The Best of 2600: A Hacker Odyssey by one Emmanuel Goldstein. Despite my own youthful adventures (perhaps chronicled in a future post) with computers and networks, I never got into reading 2600, probably for the better. But, the book represents the best of the magazine and it’s worth reading through more mature eyes. Why? The hackers are playful. They are creative under duress and with limited resources at their disposal. They tell stories. They share mental models of the networks they’ve compromised. They are the explorers of the networked world. 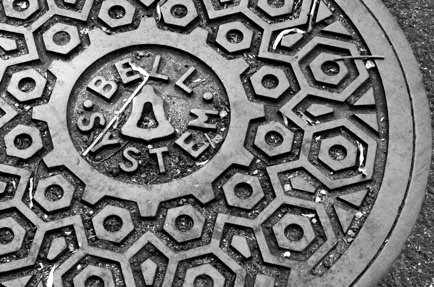 They are social—they understand that networks connect people. Of course, this assessment glosses over the criminal and arrogant aspects of hacking. But, the concepts of exploring, building, and sharing knowledge and models are valuable skills for the innovators of tomorrow. Perhaps we can learn something from the hackers? Rant: Where did the Simpsons go? The last iota of intelligence on the local Fox station vaporized. The FCC could easily revoke their license for failing to serve the public interest. 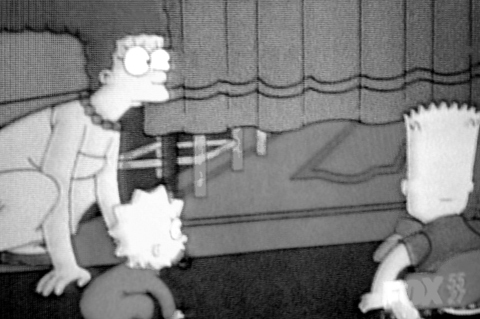 When we moved to Champaign-Urbana, the Simpsons were on at 5:00 and 6:00 on weekdays. If I worked later than 5:00, I could always see the 6:00 episode. The 6:00 episode was replaced about two years ago with “Two and a Half Men.” That’s like replacing your trusty Ford Taurus with a Daewoo, sure it’s a little cheaper, but you’re still driving a Daewoo. No, actually worse, because “Two and Half Men” is inane. I was disappointed; but, I did make sure to catch the 5:00 Simpsons a couple of times a week. In June, the station discontinued the 5:00 episode of the Simpsons for a second half-hour of “King of the Hill,” which also airs at 5:30. Why anyone would want to see an entire hour of “King of the Hill” every day is beyond me. Although, I am grateful that I’ve seen a few episodes of it because the Simpsons did an awesome “King of the Hill” alley scene. So now, we get an hour of “King of the Hill” followed by an hour of “Two and Half Men.” I don’t know who their target audience is; but, they have to be getting dumber watching that. Part of the grand Fox plan of idiocracy, I guess. On the bright side, I guess that’s an hour or two of my week I get back. On the other hand, the Simpsons was somewhat educational in the sense that it packed a lifetime of popular culture and historical event references into a half-hour package I could understand without having to sit through all of those other movies and TV shows. This week has been a banner week in the publication department. On Tuesday, we got the proof of our paper “Optical observations of the growth and day-to-day variability of equatorial plasma bubbles” back from Journal of Geophysical Research. On Thursday, I completed the final draft of “A multi-instrument technique for localization of equatorial ionospheric scintillations” which will go either to JGR or Radio Science on Monday. And, also on Thursday, the National Contest Journal showed up with my article on bandpass filters and switching. Unfortunately, I’m not completely happy with the NCJ article from a variety of standpoints. I don’t believe it represents my best work, and I tried to cover too much too quickly. I’m not really an expert on filters, either, just a cheap ham (that is, poor grad student) trying to do SO2R on a budget. Perhaps I should have taken that tact. Live and learn. On the bright side, Zack Lau, W1VT, sent me a couple of QEX articles he’s written on filters for in-band operation. I’ll have to look into those. I hope to put an errata/bonus material page for the article on the filters part of the site. Back to the grind of crunching numbers so I can write about them…I guess that outlook sounds bleaker than it really is! I mentioned recently that I posted an old ThinkPad that I built from eBay parts on Craigslist. A (Vietnamese) woman very enthusiastically contacted me about it because her old ThinkPad of similar vintage had been recently broken by her daughter. This whole experience is probably worthy of a post in itself at some point. But, on the phone, she said, “I see you have ‘$45 or offer’ on the ad…how much you take for it?” Here, let me show you my cards so you know I’m bluffing. I told her that I had about $45 in the computer and would like to get that; but, she was free to offer me what it was worth. “Forty dollah, thirty-five dollah, thirty dollah?” she said. I told her I’d take $40 for it. So, what’s wrong with this? Well, lots of things. Never ask the seller what they’ll take for it…you don’t find that out until the end! If you have the opportunity to see the item before buying, don’t start bargaining until you’ve seen it. Don’t start bargaining at the top. I don’t think I’d have let it go for less than $40. But, when she said $40, I can’t go lower than that anyway. She’s blocked herself in at $40-$45. Maybe this is a cultural difference. But, I doubt it. I study the ionosphere “professionally” right now…so, of course, this piqued my interest. Although I’m an aeronomer, I’ll be the first to admit that the author probably has more experience with sporadic-E than I do. That said, I don’t completely believe him. He presents several data sets, both from the MST (meso-,strato-,troposphere) region and the ionosphere. Given a lack of “activity” in the troposphere, he concluded that the sporadic-E was caused by a CME (coronal mass ejection) from the Sun. Why don’t I believe him? He invokes no physics (either through citation or explanation) to tie the CME to the formation of sporadic-E. Furthermore, also note by his own presented data that the effect of the CME wasn’t noted at SOHO and GOES until 0200 UT on the 17th, but the Millstone Hill ionosonde was seeing sporadic-E as early as 0000 UT. Since I quit reading eHam due to the low SNR (signal-to-noise ratio), I’ve started reading news blog salon.com. Of course, whenever you enter a politically-charged environ such as Salon, you’re bound to encounter the same SNR problems as those elsewhere on the web. A cellphone is a microwave, and basically the reason your ear gets hot is that you’re warming it with a microwave. Do I believe that cell phone usage is 100% safe? No. But, I am concerned by the fact that people, especially in politics and the media, who have a tenuous grasp of science, are shaping policy opinions based on their junk science. A project that my advisor and I are working on in South America got picked-up by the Weather Channel for a series about “extreme weather.” He showed me the broadcast recording (video file) of the story. The first thing I noticed when he played it was that the title at the bottom of the screen said, “Ionispheric Storms.” What? Yes, they spelled ionospheric wrong. “Well, that’s just a typo, ” you say. No, it is a failure of a system that is more interested in getting a story out than reporting something interesting or useful. I’ve seen this sort of thing over and over on the War and Weapons Channel, the Discovery Channel, and others. I really can’t stand to watch TV shows about things that I’ve worked on these days because many of them are simply inaccurate. Why should I have reason to believe that the news or anything else is more accurate? In a line of thinking I owe to statistician and information design expert Edward Tufte, real problems are messy and multivariate, rich and full of information and relationships. The more we learn about science, we should endeavor to make what we have learned more real, not more dilute. Everyone must know and learn more to do this. But, we will be rewarded for it.